Labor understands the important role that primary industries play in our economy and our community. Agriculture makes a significant contribution to the State’s employment, exports and investment. Labor is committed to growing the agricultural sector so it continues to be a key driver of Tasmania’s economy. Tasmania has huge potential for growth in primary industries but the sector is not immune to challenges, including threats to biosecurity and the impact of the changing climate. It is the Government’s role to manage risks and, where possible, turn them into opportunities. Labor has worked with a large range of stakeholders to develop a suite of policies to grow and protect the agricultural sector. We will continue to listen to the needs of primary producers through the establishment of the Primary Industries and Forestry Industry Advisory Council. Labor will restore the frontline of Tasmania’s biosecurity system. Over the past four years we have seen unacceptable biosecurity breaches, including Norwegian salmon on supermarket shelves, blueberry rust and myrtle rust and the state’s first outbreak of Queensland Fruit Fly. We will prepare a Biosecurity Emergency Management Plan, similar to the Emergency Management Plan that covers natural disasters like bushfires and coordinates agency responses. This will include specific preparedness projects for potential biosecurity threats. Our brand is one of our competitive strengths but we need to build on the foundations of what is already established. 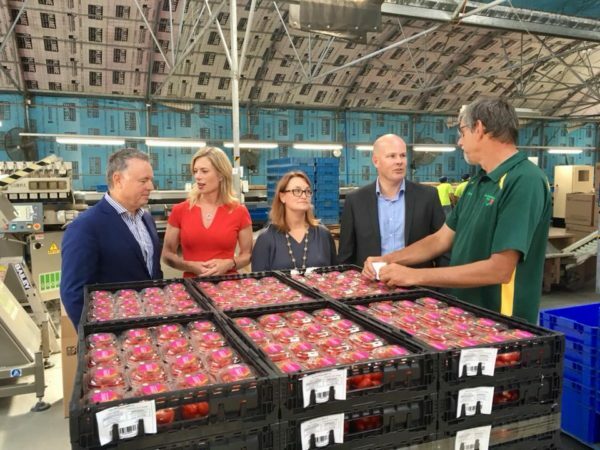 Labor will adopt a value-chain approach to marketing Tasmanian produce. Our state’s fabulous food should, as much as possible, be branded “Tasmanian” for interstate and overseas markets. Labor agrees that for the agriculture sector to remain competitive the focus needs to be on attracting, retaining and developing a motivated workforce. Our policy reflects our core belief that the primary role of our education system is to get our future generations job-ready. Through the Primary Industry and Forestry Advisory Council, a Workforce Development Plan will be developed that can inform and direct the allocation of skills and training funding to where it is needed. Industry priorities will be set through the Industry Advisory Councils and ensure TasTAFE can be rebuilt to deliver the best possible skills outcomes for workers and employers. Labor will investigate the consolidation of existing research farms onto one site to create a Centre of Excellence in Agricultural Research, Education and Commercialisation. Tasmania is well placed internationally to become a destination for leading agricultural research, to the same level as the science undertaken by leading bodies such as the Menzies Institute for Medical Research and the Institute for Marine and Antarctic Studies. The primary purpose of the Centre of Excellence would be to integrate education, research and industry together in a central location. The site will be expected to house a commercial kitchen and food manufacturing facilities at the same location to create a truly world class paddock-to-plate research and innovation hub. Labor supports the need for an ongoing commitment to our clean, green image through strict primary production food safety laws, a moratorium on commercial release of genetically modified food crops and animals into the environment, a ban on fracking for oil or gas and to continue our hormone growth promotant free status. Labor supports world leading animal welfare standards in food production. Restrictions on sow stall and cage-egg production will assist industry to adapt to changing consumer preferences in this area. Labor recognises the need for a properly funded animal welfare inspectorate service. A Majority Labor Government will provide assistance to farmers to invest in equipment to reduce the risk of injury and death to quad bike users. A Majority Labor Government will assist Tasmanian Women in Agriculture to build capacity for more rural women to take leadership roles in Tasmanian primary industries.